CBD Oil Review rates Premier CBD Oil with one star because it qualifies for the Innovation Badge. 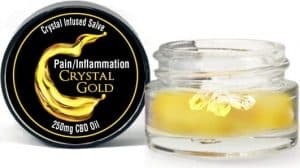 Premier CBD Oil offers a dozen products, but seems to focus most on their innovative line of crystal-infused salves. The products offer something different and, by the looks of things, seem dreamy for the skin. Still, elsewhere on their site, the hard evidence to back up the quality of their all-natural products is hard to find, and Premier CBD Oil offers no further information to support their claims of lab testing or how the CBD oil in their isolate products is extracted. Do you believe everything happens for a reason? The owners of Premier CBD Oil might. Their path to distributing CBD-based products to the masses began with an accident, when the daughter half of the mother-daughter ownership team, Paige, suffered a terrible concussion in 2015. Plagued for weeks by dizziness and headaches and unable to look at screens or lights, she only felt relief once her mother introduced her to some “strong CBD oil.” Within a few days of starting the routine, she says, all her symptoms were gone, plus some bonus abetting of her ADD and OCD. After her success story, Paige and her mother began recommending CBD oil widely to friends and family, and in the process, began keeping track of who the product helped, who it didn’t, what type of CBD oil product they’d taken and how much of it they took. Still, many of those meticulous notes are missing from the company’s website. One is hard-pressed to find any type of focused mission statement or even a broader idea of a mission—other than to sell CBD products. Information on extraction methods, product sourcing, and batch testing are also nowhere to be found. 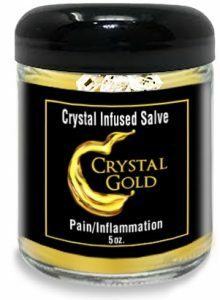 We like that they think outside the box by bringing crystals to the mix in their signature Crystal Gold salve. The company says the skin cream is infused with blue lace agate, which is thought to have stress-relieving properties. The rest of the ingredients for the salve seem equally relaxing and rejuvenating for the skin, including shea, jojoba, Vitamin E, aloe, and lavender, among others. 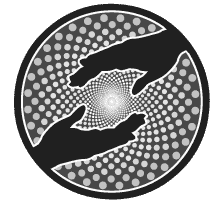 Along with the special salves, the company also offers a crystal-free version, as well as several tinctures, CBD capsules, gummies, and a tincture for pets, which range in price from $45 to $195. Some free samples are also available. Most of their line are isolates, which only include the CBD extracted from the plant, though they do offer a full spectrum tincture, which includes all cannabinoids found in the cannabis plant. And while we appreciate this variety, we do wish they could include more information on where the products are sourced from, and what types of lab testing they undergo. Bottom line: If their products are truly what they claim, they would truly be quality, but we can’t find enough hard evidence to give them this stamp of approval, nor many others. Premier CBD Oil uses some unusual ingredients—crystals—in some of its products.